Prom night is one of the most significant events in a student’s life. It is one of the few events that still retains the magic of tradition. A romantic couple have the chance to feel like members of royalty in formal attire, as they dance the night away with the one they adore. The memories are intended to last forever. Being picked up by a limousine is the perfect way to begin prom night. Both girl and boy feel a sense of privilege when the limo driver arrives at the door to pick them up in a luxurious over sized vehicle. Young men and women spend a great deal of time and money on the outfits they will wear to the prom. Women often have their hair specially done for the affair. A limousine has a lot of seating room and space so that long dresses and formal suits don’t wrinkle on the way to their cherished night together. There is plenty of room for the accessories that go with prom night, such as flowers, purses, and gifts. Prom events are held in cold and warm weather, so it is especially important to be in a vehicle that is climate controlled. Nothing breaks the mood of a magical evening faster than riding in a chariot that is too warm or too cold. Limousines are both heated and air conditioned with customer controls for personalized comfort, so that is never a problem. Adding to the ambiance of the special night, a personal limousine contains a bar with complimentary drinks of which you can make sure they are non alcoholic. Radio and television are offered as choices for passenger entertainment. The couple has time to relax and share special moments before the enchanted evening begins. Although most prom events include a professional photographer, couples usually want to take their own photos of the night. A limousine presents a unique photo opportunity for parents to take posed photos of the couple as they embark on their journey. Such photo moments last forever and will be remembered for years to come. A limo ride is door-to-door, so the couple will be escorted directly into the ballroom of the event by the limo driver. If there are any packages to be carried, the driver, who is trained in the best of customer service, will be only too happy to help carry them. 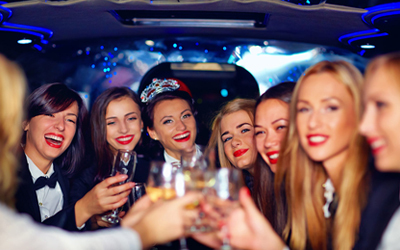 The young woman who is picked up in a luxurious limousine feels treasured by her date for the evening, and the couple will be envied by friends and acquaintances who notice their arrival.